Brad Marchand is expected to miss the Boston Bruins' visit to the Buffalo Sabres on Saturday as the forward did not practice on Friday with an upper-body injury. There are good chances that Marchand will get to finally play in a Winter Classic next wee as he will travel with the team to Notre Dame, Bruins head coach Bruce Cassidy confirmed on Friday morning. He could therefore be in the lineup when the Bruins will take on the Chicago Blackhawks on New Year’s Day. Thursday night was a night to forget for Marchand, who started the contest against the New Jersey Devils off on the wrong foot. The Devils did not waste time as the opened up the scoring with just 25 seconds gone from the clock, however, when we look closely at Damon Severson’s goal, we quickly notice that Marchand was speared into the throat on the play. Marchand took a spear to the throat off a face off and needed to skate off the ice to reach the team’s bench when the Devils skated down the ice and score the first goal of the game. It did not stop Marchand from pulling some of his old antics throughout the game, however, it all caught up to him in the third period when the Bruins pest did not manage to finish the game as many insiders reported he took a head shot in the third period and left the contest early. However, Cassidy said Marchand was dealing with a stomach bug ahead of Thursday night’s loss to the New Jersey Devils in Boston and Saturday's potential absence could be related to that. Some fans wonder if Marchand is simply being kept out of the lineup as the Bruins might want to be making sure he doesn’t do anything silly Saturday night to earn a suspension for their National TV clash with the Blackhawks. As we all remember, Marchand was suspended back in 2016, just ahead of Boston’s last Winter Classic appearance and ended up missing out of the clash against the Montreal Canadiens at Gillette Stadium. We will have to see as we get more updates on Marchand's status in the next few days. 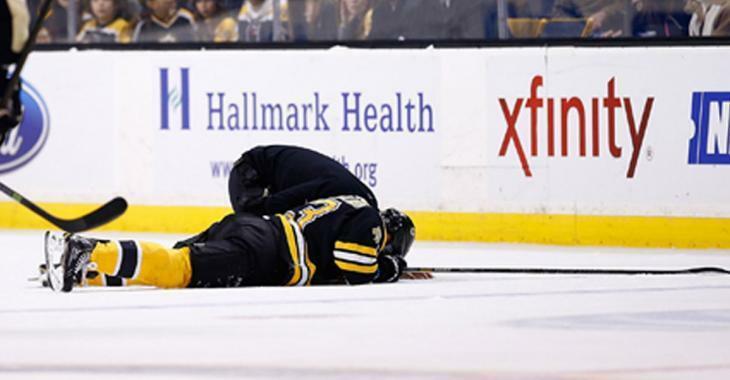 This season, the injury bug has been all over the Bruins; especially defenseman Charlie McAvoy. The young blue liner is back on injured reserve and will miss his second straight game on Saturday night. McAvoy recently missed 20 games with a concussion, and is currently dealing with a lower body injury after blocking a shot in Sunday’s loss to the Carolina Hurricanes. The young defender is expected to travel with the team to Buffalo, and if healthy, will be eligible to return for the Winter Classic.